Transcripts of the former US treasury secretary's more, ahem, honest account of the crisis have been leaked. 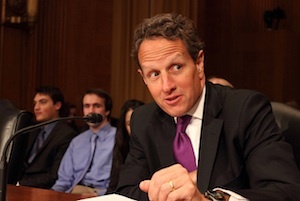 Stress Test, the book by former US treasury secretary Tim Geithner released in May, gave us some insight into the turbulent goings-on that occurred at the height of the Eurozone crisis. But early transcripts obtained by the FT contain a much greater level of detail which are sure to leave European leaders feeling embarrassed. 2. ‘It was embarrassing to them because the Greeks had ended up like borrowing all this money and they were mad and angry and hey were like: "Definitely get out the bats." He also described how EU leaders attempted to force out Silvio Berlusconi as Prime Minister of Italy, after German actions which bought a little bit of calm for the markets were met by Mr Bunga-Bunga aparently reneging on promises. He also had some less than kind words to say about Ireland’s decision to guarantee all of its banks in 2008. The revelations have not gone down well in Greece, and as the prospect of an election there looms and the radical anti-austerity left party Syriza tops the polls, it looks like the Eurozone crisis could be far from over.